Modern data protection means combining existing technology with machine learning in a SaaS model to protect physical and virtual computing systems. Hi! I'm Mike Matchett with Small World Big Data, and today we're gonna talk about some advances in data protection. We all have to do data protection. Data's getting bigger, our operations are getting more distributed, complexity is rampant, and costs are high, especially if we don't protect our data and we have to try and recover and keep some business continuity going. But there's lots of problems as we're talking. And yesterday's solutions just don't close the gaps anymore on may of those facets. Today I've got Mark Ward, who's the COO of Cobalt Iron here, to talk about their solution for data protection. And they've come to it from a kind of unique angle, and seem to have something that ticks off all the boxes for large enterprises. So with that, let me introduce Mark. Welcome. - Hey, hey Mike, how are you today? - Good, good! So, before we get into adaptive data protection, which is what Cobalt Iron sort of wraps their solutions around, where did Cobalt Iron come from? What's the background of that? - Yeah, and the background of Cobalt Iron is a number of 20 plus year storage and data protection experts got together about six years ago to remove the complexity, the cost, the consumability of data protection in this new landscape, where cloud, as a service, and massive reorganization of cost structures from capex to opex exists. So, the lineage is a bunch of EMC, IBM, Hitachi data systems, Convault folks, who've been working to solve those enterprise problems for many years. Figured a better mouse trap. - All right, so. Something that catches more mice, right? - You got it! - As we're talking. So, let's talk just briefly, a little thumbnail sketch, about what is it tangibly that Cobalt Iron offers and brings to market? - Yeah, fundamentally it starts with what we have seen the customer requiring of the enterprise IT world. And that is, get us out of having to manage the day-to-day complexity of provisioning assets, managing, maintaining, and driving, let's call service levels, to the business. For us, we're 100% focused on the data protection elements of that. So what we've done, is we've used some of the technology innovation of the past 10 or 15 years, to really change the way data protection is delivered. Now, I can kinda summarize them into a couple of comments. Number one, virtualization. I think our colleagues at VMware did a great job solving server virtualization. What if we could take the same constructs of virtualization to the data protection landscape? Making assets, whether they be physical, hybrid, or cloud assets available, to be deployed in managing data protection? The other key element is salesforce.com's innovation around as a service, or software as a service, delivery. So don't require your own IT teams to deliver, use smart technology. And in our case, very much analytic-driven automation to simplify these distribution and the service level management of data protection. And the last one, Mike, is motherhood and apple pie, and that's eliminate cost, and we do that by leveraging common off the shelf hardware, as well as cloud assets, to bring a much lower cost and higher level service to data protection. - So, if I'm understanding this right, you're gonna come in to someone who's got this complex, heterogeneous, probably incomplete data protection environment, if they've just been patching together their legacy stuff over years. And you can say to them, "We're gonna come in, "and we're gonna put in something cohesive. "We're gonna remotely manage it for you. "We've got automation, we've got intelligence. "And we're gonna apply all our best practice. "And we've got this commodity hardware, virtualized approach "that really runs your costs "below where you could possibly even think "that they would go." - Yeah, well, let me be even more granular in terms of what the answer is. So number one, we are not a rip and replace vendor. There's been a lot of - Okay. - innovation in the industry, where it's like, "Hey, everything you've done before I showed up is bad." We don't believe in that, particularly when it comes to the data protection landscape. So we'll leverage the existing application, we'll leverage some of the existing assets. We will modernize assets that require it; those that are into their maintenance years, so to speak. So we'll upgrade storage, server, network assets that require upgrade. But we'll leverage existing infrastructure as we journey they to this, as a service cloud modern approach to it. And that's where, to your point, we leverage the intelligence of our software as a service delivery, to manage, maintain, and drive costs down of existing assets and new assets in the IT infrastructure, particularly servers, storage, and network devices. - So is this, so as you say, it's not a throw everything away lift and shift, or this. You're really gonna come in and say, "Look, we can deliver you data protection as a service, "and we'll use what you have. "But we're gonna bring in lots of other things around it "and put it all together "into something we know is a best practice expertise way "to deliver this, and do that." When folks do this, then do they have to go though a big internal justification process to do this? It sounds like it's more of, "Hey, I can save money and I can get done "what I'm trying to do anyway." Well, you know, data protection tends to be very much a cyclical buy. When you look at both the infrastructure assets and how folks address it. So we tend to grab customers when they're doing one of two things. Number one, upgrading existing environment for a new workloads, such as new virtual workloads, or new cloud workloads. Or we catch them on a cycle where their existing infrastructure, quite frankly, is moving to its maintenance period and is very expensive to maintain, so they're looking for a refresh, so to speak. They're looking to take advantage of the lower cost at the infrastructure compute level, and they're looking at lower cost service delivery capabilities. I think the neat thing that we've figure out, Mike, which really changes the industry approach to backup. There have been 800 pound gorillas in the market that throw a lot of smart people at the problem and say, "Hey, instead of you managing the environment, "let my people manage it for you." Over the past seven years we've realized that that's really a flawed approach, and what we've done is we've taken very smart people-based processes, turned it into software, built that software in the cloud in 22 different data centers around the world, and it's that cloud that automates, through analytics, the delivery of data protection services to literally, we're currently deployed in 44 different countries, managing tens of petabytes of data protection per night. And we do that with a call support staff of just a couple of folks that manage questions about using the product. Not actually, our people don't manage, they don't touch folk's data, they don't manage server connections or network connections. Our software is the intelligence that does that and it's all in the cloud. So we touched on cost. Obviously you can help someone manage the complexities of things, multi-product environments, distribute environments. But it sounds like when you start talking about what your scale and reach is, that you're really saying, "If you use Cobalt Iron for your data protection services, "you can achieve a kind of data center modernization." Or you can at least help accelerate that. And particularly folks who are looking and saying, "I've got applications now that are hybrid. "I've got applications migrating to the cloud. "I've got things in flight. "I've just got rampant virtualization "but I still got some physical servers over there "in the corner, so I've got this heterogeneity." Do you find folks really resonate with the modernization kind of aspect for what you're doing as well? - Yeah, I think 90 plus percent of the clients and prospects that I meet with on a day-to-day basic, are looking to get out of that day-to-day grind of managing the delivery of data protection. They're looking for smarter systems, they're obviously looking for lower cost systems. They're looking to leverage technologies, for example, like ServiceNow, which is used as an incident and event management system. 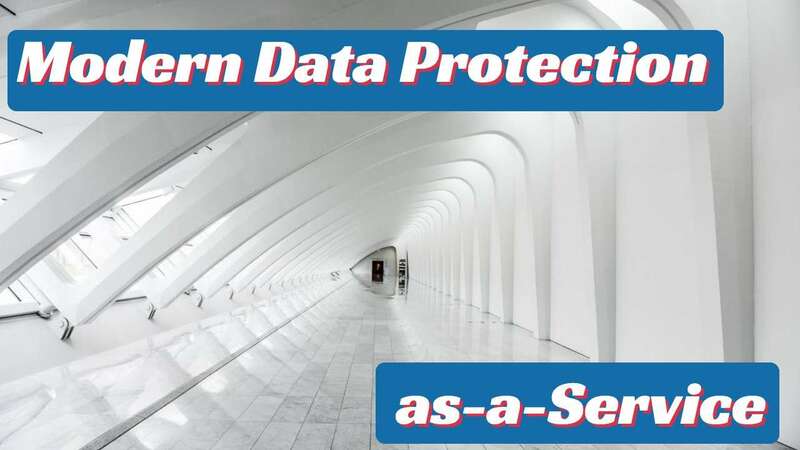 Why doesn't data protection fall underneath the ServiceNow umbrella? Well, the answer in Cobalt Iron's world is it does. - Okay. - I'll give you another example of the simplification of delivery. A lot of our customers use VMware's vRealize from a provisioning and a decommissioning system technology for virtualization. Well, why at the time you decide to provision a new virtual machine? Why wouldn't you apply data protection elements to that new machine at the exact same time? So we found the integration into vRealize, to be a very, very valuable and scalable deployment architecture for our cloud based, and on prime physical system customers. So, that combination of making the modernization decisions you're taking as an IT organization, consistently aligned with what you're trying to do in all your stovepipes, whether it be data protection, server provisioning, IT incident management. At Cobalt Iron, with a restful API stack and our Fortune 1,000 customers that we deployed over the past seven years, we've really figured out how to bring those technologies together, so one plus one in our case actually does equal three. - So I know, I've seen some of the cost arguments, that you can recover unused licenses and reapply them and realign them, and similar things, where you can actually justify a lower cost for what you do, than what's already probably being paid for for the incomplete solution today. And then, I know that there's this modernization angle to it as well, which is all very interesting. And I couldn't even, I was about to say, "Hallelujah" a couple of times when you're like, "Why doesn't ServiceNow have data protection in it, "why doesn't vRealize have data protection into it?" I don't know! It seems like coming from the data protection world, that those things, we've known about them for 30, 40 years in IT, they should all be built-in. With that, I'm sorry Mark, we've run out of time on this first piece here, but we want to definitely dive in and talk to you some more about some of the specifics of what you guys do under the hood, 'cause it's very cool stuff. Any last words though, where someone can find out more information about Cobalt Iron, or get started with you guys? - Yeah, www.cobaltiron.com. We've got a field organization around the world that would be happy to work with your existing environment, and show you the power of adaptive data protection. - Awesome, awesome. Thanks for being today Mark. - Take care. - And thank you for watching. Again, this is Mike Matchett from Small World Big Data, and we'll be back with some more data protection coverage soon. Take care.